Every instructor knows that airplanes make poor classrooms. The noise, vibration, cramped space, communication challenges, interruptions from ATC, and the need to watch for traffic while monitoring location, airspace, and aircraft systems all conspire to prevent effective learning. Oh, and let’s not forget the exorbitant cost of operating this aluminum schoolroom. Well if it’s true for the docile trainer, imagine the high-performance aerobatic airplane. They’re even worse than a standard aircraft because aerobatic steeds are designed for performance above all else. Those creature comforts you’re used to in a typical GA airplane? All gone. These beasts are louder, more confining, and typically feature tandem seating so the instructor and student cannot see one another. They impart greater loading, heavier vibration, and top it all off with temperature extremes due to lack of heat in the winter and sun beating down on you through the canopy during the summer. Very rarely is the environment and airflow optimal for anyone’s comfort, especially when you’re sitting on an nonadjustable, non-ergonomic, hard wood or composite seat and wrapped in a bulky parachute, five-point harness and headset/helmet. A lousy classroom by anyone’s standard. 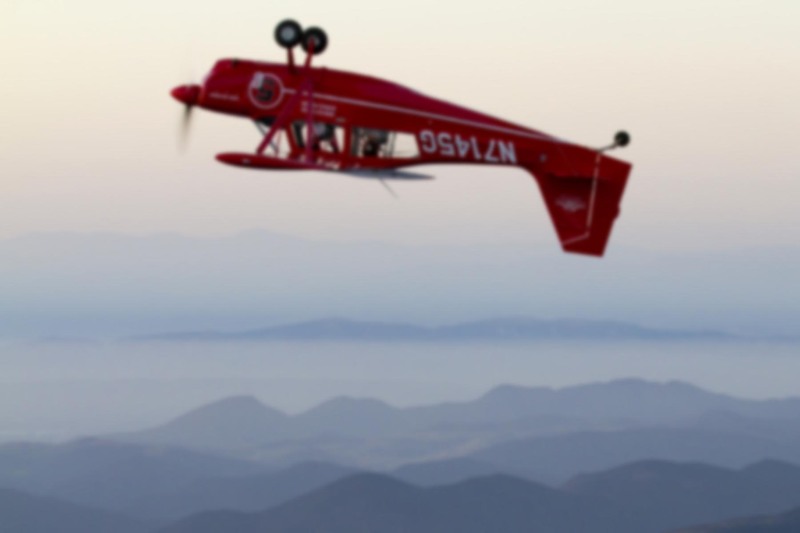 Now suppose you want to teach someone to perform a snap roll — one of the more difficult maneuvers in the aerobatic catalog. Jumping right into the airplane can yield poor results, leaving the student feeling like they’ll “never get this”. Snap rolls are tough on body and airframe alike. Heck, even the simple act of defining the maneuver using a short, concise phrase can prove challenging. Most people refer to them as a “horizontal spin”, but that’s not entirely accurate. It masks the fact that they can be flown on up-lines, down-lines, amid looping segments, and anywhere in between. Over the years, I’ve whittled down my standard definition to: “an accelerated spin along the aircraft’s existing flight path”. The real problem with snap rolls, though, is that they are of such short duration that it’s impossible to provide any guidance during the figure. They start and end in the blink of an eye. And if they zip by that quickly for the instructor, imagine how difficult it is for the student to get anything out of it. “Did you see…?” If the student is being honest, they’ll probably admit they didn’t see much of anything. The early experience is primarily one of feel, and the feelings are uniformly uncomfortable, with the gyroscopic and other forces torquing the airplane off to God-knows-where. So the question remains, how do you effectively teach them? My general instructional philosophy is not to use the student as an autopilot. That means I try not to tell them how to mechanically move the flight controls. It’s far better to focus on where to look and how a figure should appear from the cockpit, because the goal is to eventually get the instructor out of the airplane and have the student doing it on their own. For that to be effective, they have to reach the point where they can diagnose their errors and therefore determine how to fix them. Mechanical teaching doesn’t achieve that end because a) it’s a rote method, and b) it keeps their attention inside the airplane instead of outside where it belongs. Unfortunately, where snaps are concerned it’s tough to teach them using traditional methods. Efficient aerobatic instruction is challenging enough when you’re doing a loop, hammerhead, or Cuban. Those figures last ten or fifteen seconds. A snap roll is over in about one second, and what’s happening is far more complicated. That’s why snaps are an exception to the rule, and one of the only things I teach mechanically. Obviously any good CFI will start with the academic side so the students understands the mechanics, aerodynamics, elements, hazards, variations, and common errors inherent in the maneuver. Two useful tools for the ground portion are a model aircraft and a video clip of a snap roll as seen from the pilot’s perspective. Once they’ve got an idea of what this snap roll business is all about, I’ve found it useful to sit in the plane with them and work through the physical movements in slow motion. I’ll narrate and move the controls, having them follow along. Lather, rinse, repeat. Eventually I’ll speed it up to the required tempo. Then they get to do it. The environment is quiet, calm, and inexpensive. Once the mechanics are learned, I ask them to focus their attention in front of the airplane and imagine the aircraft’s response to the control inputs as they “fly” it. That gets their eyes outside the aircraft, just as should be in the air. And since they’ve seen the video, they know what it’s supposed to look like. With enough rehearsal, it’s possible to take the lesson into the sky and be quite productive because some muscle memory has already been imparted. Let’s face it, teaching snaps rolls can be extremely uncomfortable for the student, and as the one not flying, that goes doubly so for the poor instructor. The teacher never knows when that hard pull is going to come, and early snap roll efforts tend to devolve into weird tumble-like figures, occasionally with significant negative-g. This eats up any pilot’s endurance pretty quickly and limits what can be effectively accomplished on a given flight. You might think this is an insignificant concern, but I’ve met pilots who really start to question the expenditure of several hundred dollars per hour only to come down feeling like they’ve gone a couple of rounds with Mike Tyson after stealing his tiger. One pilot I flew with in the competition environment hated them so much that he swore off the activity altogether after Sportsman. Some discomfort in the initial stages of flying snaps in inevitable, but a thoughtful approach to teaching them can lessen the pain for all involved. For me, they were a reminder not to be too dogmatic about my instructing methodologies. There are exceptions to every rule, so it pays to have an open mind about how we do things. In the end, we’re all trying to reach the same island. It’s been a while now and my memories of the teaching method are hazy, but I remember I LOVED learning snap rolls. Your wider point is the real value though. Airplanes are expensive classrooms and I don’t remember any of my flying instructors being keen on doing much ground instruction ever. Right from ‘effects of controls’, they wanted to teach it in the air. A chair and a plunger stuck to the floor is a vastly underrated training aid. (But I concede that sitting in a parked plane would be good too.) Either way, not wasting a student’s money is good customer service. As for the money thing, efficiency with the trainee’s resources has always been important, but with the cost of flying escalating like a college tuition bill, it’s more critical than ever if we want to do our part to keep people in the air! It’s sad to see how dramatically the participation rate (on the competitive aerobatic side at least) has fallen over the past decade. Ron, love your blogs, as always this one was fun to read. I have a question regarding the snap roll, but not so much how to teach it. I am just about to become student pilot and begin my groundschool in a few months here. Could you explain why the rudder causes roll in this case? My understanding of it relates more to swept wings with a yaw induced “lengthening” of the upwind wing. But with an aerobatic aircraft, with relatively minimal wing sweep, the physics of this don’t make sense in my head. Thanks! As to the snap roll, that’s an excellent question. The best understanding of snap rolls will come from a thorough knowledge of spins, because the snap is literally an accelerated spin. The rolling motion comes from the fact that one wing is more stalled than the other. The reason the wings have different angles of attack (and therefore lift & drag) is because of the yawing motion created by the rudder. The yaw accelerates the outside wing and decelerates the inside one as the airplane yaws around the vertical axis. Hope that’s not too confusing. The aerodynamics are not terribly complex, but the clearest explanation typically requires a demonstration using a model aircraft. The short answer is that the rudder doesn’t cause roll, it causes yaw. But the yaw eventually leads to a rolling motion. NO WONDER MY SNAP ROLLS WERE SLOPPY! NO RUDDER. I WAS SELF TAUGHT AS YOU IMAGINE. No wonder my snap rolls were sloppy!! No rudder. I was self taught as you can imagine. Is this better? No rudder? Without the yaw, there’d be no autorotation. I’m not sure that was a snap — might have been more of an aileron roll, barrel roll, or some combination thereof. Fun read Ron! My old Bucker Jungster I with it’s swept wings loved to snap. I really enjoyed teaching them to myself, but it was scary and not recommended. I remember reading about your adventures with the Jungster and teaching yourself aerobatics. I was amazed to read that it had a +10g positive limit! I would never have guessed that. Musta been a real hoot to fly that thing, let alone teach yourself snap rolls. Just as a point of trivia, when the snap roll was discovered by Russian pilots, it was when aileron roll went wrong. So in Russian terminology, it is called “the incorrect aileron roll”. It is primarily taught to fighter pilots to apply in case of inferior position in order to provoke an overshoot by the attacker. That’s very interesting, Pete. Snaps certainly do create a lot of drag due to the high angle-of-attack and yaw, so I can see how they would serve that purpose. It’s difficult to imagine a modern fighter jet performing one, though! Actually, I might be wrong, but if memory serves, the first snap rolls were used in WWI dogfighting. Those airplanes may have had leisurely roll rates using ailerons alone. I just did a cursory web search for some documentation of this and couldn’t find anything substantial and reputable; the closest reference I found was a modern pirep for a rotary-powered Sopwith Camel (see http://www.flyingmag.com/pilots-places/pilots-adventures-more/calculated-sopwith-camel). In addition to this link, there were some hits regarding snap rolls in WWII fighters for the reason Author mentions above. Anyway, Ron, Ben Freelove has a terrific method for developing a student’s technique and feel for snaps. I use it myself whenever I’m first flying a new/different aerobatic airplane. Feel free to message or call me if you want more details.